This Saturday (21st Feb) GemArts and GVEMSG welcome back the Mini Mela at Caedmon Hall, Gateshead Central Library. The mini mela has always been a very popular event, celebrating diversity and offering families the opportunity to join in with a range of arts activity. 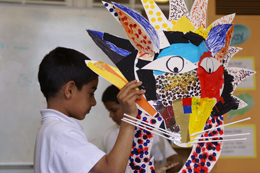 GemArts have managed to pack a lot into this 4 hour event, with Aboriginal dot painting, Indian rangoli making, Chinese dragon making and origami sessions running 10am – 2pm in the main hall, and African drumming and Mini Movers dance classes taking place in side rooms throughout the event. All sessions are free, and most are drop in so there is no need to book, the only exception is African drumming and Mini Movers where we need to keep an eye on numbers. 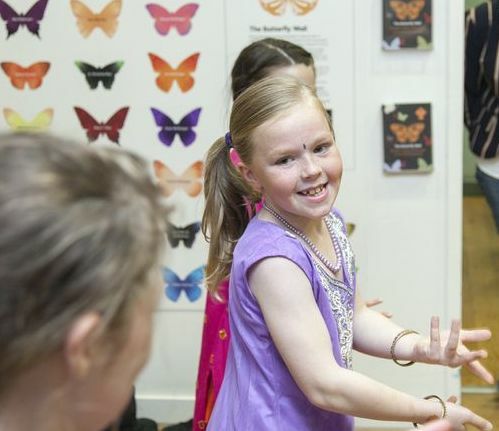 Visitors wanting to book onto the mini movers or drumming workshops can see a member of GemArts staff at the event who will book you onto the next available session. GemArts and GVEMSG’s work across Gateshead and the wider north east brings us into contact with lots of great organisations offering specialist services, advice and support. We’re delighted to be working with Gateshead Council on this event, and we have also invited some of our other good friends along. Visitors can take advantage of information and advice from Citizen Advice Bureau, the Gateshead Housing Company, and the Police. We have also invited our friends at BALTIC Centre for Contemporary Art along, Artists and Crew from the gallery will be offering visitors to the Mini Mela the chance to help create a huge mixed media spice installation. The Mini Mela will end with a huge energetic finale when Arts Isiziba bring an African Drumming performance into the main hall. ← NEW YEAR, NEW SEASON!